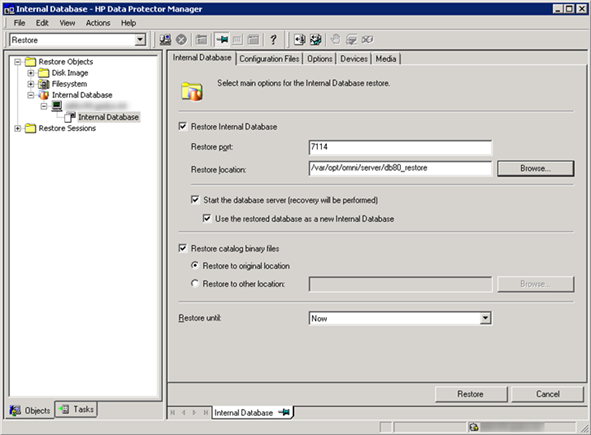 I just stumbled across an issue introduced with Data Protector A.08.00 and the new PostgreSQL database on clustered Cell Managers running on Linux and HP-UX. It’s related to restoration of IDB configuration files back to the shared disk. As you might know, parts of the Data Protector installation are stored on shared disk for a clustered configuration. The directory structure remains the same, but symlinks will point to the shared disk. This is true for the IDB located in /var/opt/omni/server and the configuration files stored in /etc/opt/omni/server. To allow the IDB integration agent postgres_bar.exe to follow the symlinks properly, you must define OB2SGENABLED=1 as an omnirc parameter on all cluster nodes that are enabled to run the Data Protector Cell Manager cluster package with Data Protector 8 and later. Please note, if this parameter is defined, the file /opt/omni/.omnirc is not backed up as a part of the IDB backup since it is local to each node. It should be included in the regular file system backup of your cluster nodes. If you migrate from a previous version to Data Protector A.08.00 or later on Windows, you might come across an issue where you’re unable to remove the old db40\dcbf directories using GUI or omnidbutil -remove_dcdir. This is most likely caused by the used path separator inside the Internal Database. Since version 8 the path separator is a simple / for UNIX and Windows platforms. 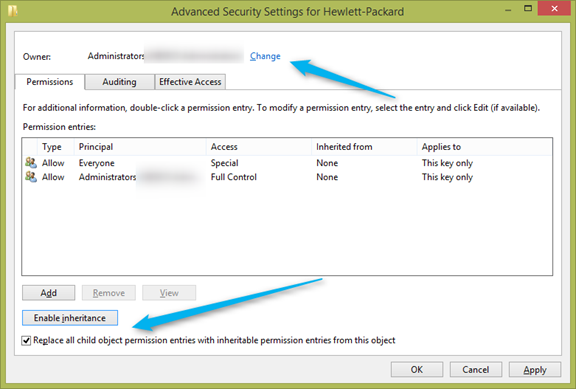 The idea here is not to follow the instructions from http://support.openview.hp.com/selfsolve/document/KM00481540, since omnidbutil -writedb is not always possible and might be dangerous. I just created a simple SQL script that will change the wrong path separator and make regular removal possible. There are situations in which you receive test modules or quick fixes from HP support to resolve a specific issue in your environment. Even if they provide instructions on how to apply them, I found the following general procedure working quite well for Linux clients and cell managers. drwxr-xr-x 2 root root 4096 Sep 4 19:29 .
drwxrwxrwt 6 root root 4096 Sep 4 19:28 ..
drwxr-xr-x 3 root root 4096 Sep 4 19:29 .. Replace the files and check if build number is reported correctly for each one and their backup. You might need to shutdown Data Protector services using omnisv stop in advance. 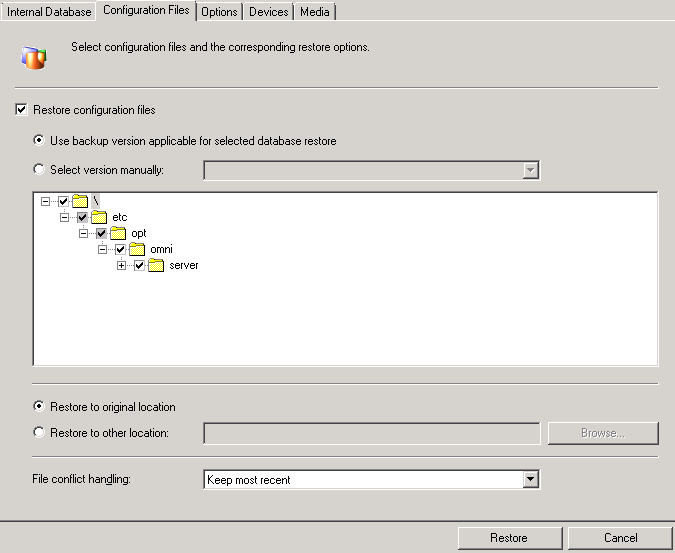 Adjust permissions and ownership not matching the backup. Start the services if stopped using omnisv start and check if the installed test module is working as expected. omnicheck -patches should list the non-standard binaries. Keep in mind to track applied Quick Fixes if you’re going to install GR patches to your cell. Check the release notes of the fixes to make sure the issue has been resolved. With that information in mind, we can do the required modifications to our Debian 6.0 client and push the Data Protector Disk Agent (DA) to the system when ready. The authenticity of host 'decm01.syncer.de (192.168.25.150)' can't be established. RSA key fingerprint is df:97:00:b2:62:33:1d:1e:fc:57:f7:94:bb:c5:f7:ba. Warning: Permanently added 'decm01.syncer.de,192.168.25.150' (RSA) to the list of known hosts. [Normal] <decm01.syncer.de> Checking for response from system decm01.syncer.de. [Normal] Client decm01.syncer.de (Linux 2.6.32-5-amd64) OK.
[Normal] <decm01.syncer.de> Installation of Core Component succeeded. [Normal] <decm01.syncer.de> Installation of Disk Agent succeeded. [Normal] <decm01.syncer.de> Update of client system decm01.syncer.de completed. 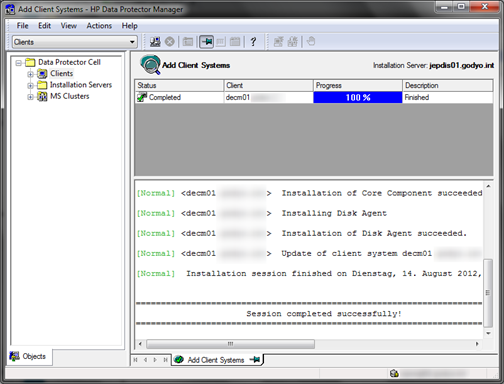 [Normal] Installation session finished on Dienstag, 14. August 2012, 20:25:02. 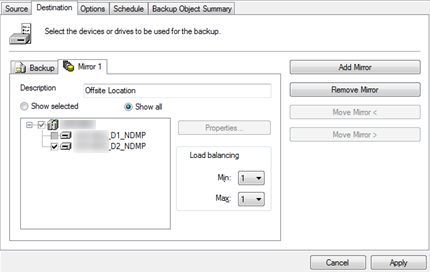 I just came across an issue at customer site where Data Protector Device Mirror was used to duplicate NDMP backups. In general this is a great way to reduce the amount of time it takes to create separate sets of media at backup time. The worse thing is, this feature is not supported in Data Protector including version 7.01. 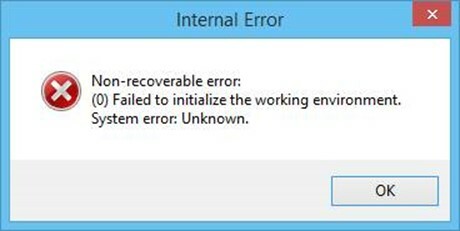 The backup will work as expected, but if you need to restore from the tape that was created using Mirror (not the original one) the session will just fail with the following error. Keep in mind, the restore from the original/primary media is working fine. This looks pretty familiar, since there was the defect QCCR2A34355 that prevented NDMP restores from completing on 6.20 and 7.00. Even with fixes/patches in place, the restore from Device Mirror (copy) will fail. This seems to be an issue with metadata not written correctly to DCBFs. omnidbcheck -sibf will show inconsistencies on all media used for device mirror. I found a workaround for this issue that works pretty straight forward and allows you to restore the data.